Stewart, A. (2013). The Drunken Botanist. Algonquin Books of Chapel Hill; New York. Amy Stewart has here provided every curious tippler with the natural origins of their favorite drinks. She is an award-winning author of six books on the natural world and lives in Eureka, California, where she owns an antiquarian bookstore and tends to a flock of hens in her backyard (what a life, eh?!) (About Amy Stewart, 2014). After doing her research for this fascinating book, she has decided to move onto fiction and is currently working on a book that will be published in 2015 (About Amy Stewart, 2014). If you’re looking for a step-by-step guide on how to ferment certain plants into alcohol, this is probably not the right book for you. 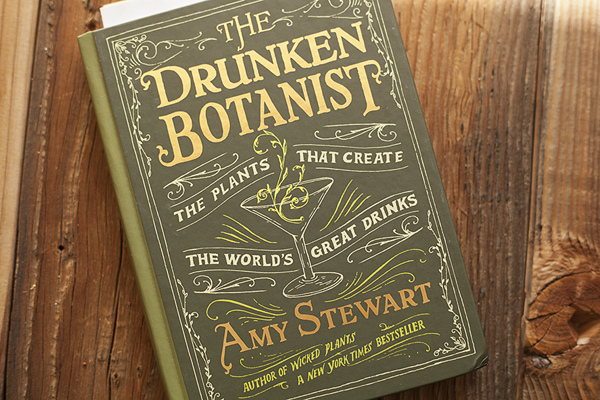 Instead, Amy draws in “biology, chemistry, history, etymology, and mixology” to describe how humans “have, through ingenuity, inspiration, and sheer desperation, contrived to transform […] herbs, flowers, trees, fruits, and fungi” into alcohol (The Drunken Botanist, 2014). It’s a primer for the curious and an eye-opener about the processes behind many modern-day alcohols. With her interest in gardening, Amy also provides regular “Growing Notes” for those who want to try cultivating hops, blackberries, and other base ingredients for mixed drinks. The book has its own website with regular postings announcing tour dates, press releases, and tips for making certain concoctions (see it here).